Rewording paragraphs if not done correctly will leave you open to charges of plagiarism which could lead to you being removed from the course you are studying. Therefore great care must be taken when you reword sentences or paragraph s to ensure that you do it correctly. The following 7 tips will help you to avoid plagiarism when you rephrase a paragraph. Using someone else’s words without credit (a citation or reference) is plagiarism and can land you in serious trouble. Direct quotations should be within quotation marks and a citation should always be given, even for short lengths of text. Just changing a few words within a text but leaving the same order and structure is still plagiarism. Changing the order of the text is still plagiarism. Using chunks of the original text with some of your own words is still plagiarism. Changing every word as a computer would for a synonym is still plagiarism. The purpose of rephrasing a paragraph is saving us time. Instead of writing a new paragraph out from scratch, we can instead bring up an existing paragraph related to a specific subject matter, before turning it into our own words. The purpose is twofold: You need to turn the paragraph into your own words so that you won’t be guilty of plagiarism, and you also need to extract the original meaning. It’s also essential that you reword the ideas simply and clearly. There will be an occasion in everyone’s life when we need to rephrase a paragraph. If you’re applying for a job but can’t nail your resume, you might want to paraphrase a paragraph from someone else’s resume. There may also be times when you need to paraphrase a paragraph from an essay, an article, a blog, or even a short story or novel. Generally, we resort to paragraph rephrase when we’re short on time or fresh out of ideas. Or maybe we just need to rehash old content, or even simplify a complex paragraph so that it’s easier for our audience to understand. Know what is rewording means: To reword my text, it is important that you know what rewording is all about. You need to express the same ideas in a different way. You need to know it so that you will avoid committing mistakes. Do not compare it with summarizing: Rewording is different from summarizing which means you need to know the difference between the two. In summarizing, you are getting the important points while in rewording, you are rephrasing the whole text with the use of your own words but making sure that the meaning will be retained. Read the paragraph thoroughly – You can’t paraphrase properly unless you fully understand the source material. Familiarise yourself with it by reading the paragraph over and over until you understand it. Don’t make the text shorter: In rewording, it does not mean that you need to make the text shorter. In summarizing, you are making the text shorter but it rewording a paragraph, there are instances that your version is longer than the original text. On the other hand, your rewording sometimes is shorter depending on how you write it. Hide the paragraph away – To make sure that you don’t copy any parts outright, hide the paragraph away before making a start. Open up the original paragraph and compare it with yours. If they are still too similar, make changes. Word choice: It is important to change the word choice when you are rewording. You need to change the words that are used in the paragraph. As a writer, you need to present the information in a unique and original way without changing the meaning. You need to explain the idea by using other words with the same meaning. Do not ever attempt to change the meaning or else you are making another story. Use thesaurus: Using thesaurus as your guide for word choice is not a bad idea. It can be your help so that you are sure of what you are rewording. With it, you can able to find similar words that you can use in rewording. Syntax: In rewording, it is not just about changing words but it is also about syntax which means it is about how you put words together in order to form a sentence. Knowing this is important to able to create a great paragraph without mistakes. Structure: Changing also the structure of the paragraph is important. You need to put your sentences in a way that will make sense because doing this will lead your reader on what is the idea you are presenting. 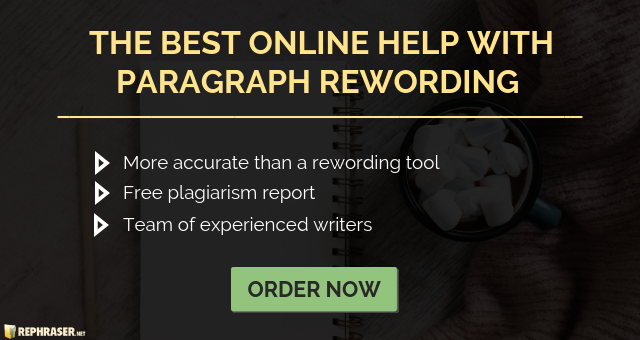 Run it through a plagiarism checker – To make sure you haven’t copied anything outright, run your rewritten paragraph through a plagiarism checker. There you have it some tips that will help you in rewording your paragraph. If you want to reword your own paragraph because you believe in yourself that you can do it, then you need to check out some tips to be your guide or try to reword sentences online. Can You Use a Paragraph Changer Generator? Paraphrasing is something of a skill and even an art form. It isn’t always easy, but in an increasingly connected world where communication is ever evolving, more and more of us need to learn how to paragraph rephrase. Essentially, when you rephrase a paragraph, you change the words so that it looks like your own original work – but you also retain the original meaning. Getting this balance right is not easy. If you’re struggling to rephrase a paragraph, let’s take a look at how to solve this problem. A software rewording tool that will rephrase a paragraph is usually called a spinner. These software programs work by systematically changing each word or short phrase in turn for its synonym. Even the very best of these programs will create text that makes little sense and that can change the meaning of the original considerably. These programs require careful editing after use if you want to have useable text. You should also realize that most of the time it would still be plagiarism as the structure of the writing would be almost identical to the original. We are here 24/7 for you and ready to roll up our sleeves any time you need our help! Leave your worries on our team of qualified and well-experienced writers and get your perfectly reworded papers within your deadline! So if you need an expert to rephrase paragraph just contact our professional and dedicated rephrasing team for affordable help you can trust!